After 42 years of enjoying life in this country retreat, the owners have mixed emotions about leaving the home they’ve made immensely livable. “Now we have it just the way we want it,” one owner says, looking out from the custom-designed great room to the towering Linden tree. The other owner agrees, calling their casually elegant home “well used” in the best sense, where every room is comfortable and has a purpose. 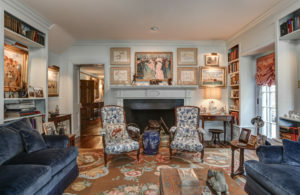 Having moved to Unionville from Chester Springs many years ago, this couple clearly enjoys the Chester County lifestyle—heritage and horses, family and fox hunting, conserved space and country life—pick your favorite pairing of attributes. And Fairyhouse, named after a famous racecourse in Ireland by former owner James Ryan, embodies all that makes life here so enviable. Ryan was a legendary horseman with a rich history, including serving as Huntsman of the Cheshire Hunt in the 1920s. Ryan lent his name to a local road. The next owners may well add to the farm’s fabled equestrian history. The barn has been home base to Hall of Fame trainers along with steeplechase winners, including two-time Radnor Hunt winner, Bomb, and Saratoga winner, Peñascal. Yet despite this legacy, the perfectly maintained, pastoral property affords the option simply to enjoy a country lifestyle, with or without involvement with horses. 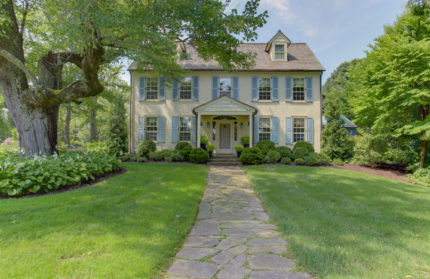 Set on 58+ acres of lush Cheshire Hunt Country farmland, surrounded by open space and connected by riding trails crisscrossing neighboring farms, what appears at first to be a classic Chester County farmhouse holds many surprises. One of the first is that the wildlife seen on the trip up the curving driveway don’t move as you approach. They’re sculptures. The next surprise is inside the understated-appearing home, which presents as a simple 1780s farmhouse with central hall flanked by two charming sets of rooms. The unassuming first impression is soon displaced after entering the spacious, sun-filled interior. Building on a 1924 expansion, two modern renovations to the original home were designed in 1988 and 2017 by famed restoration architect John Milner, known for his meticulous work honoring our region’s vernacular architectural style. The owners said of Milner, “He walked in, looked around and figured out the space.” It was up to Griffiths Construction to execute the design. And what a space it is! 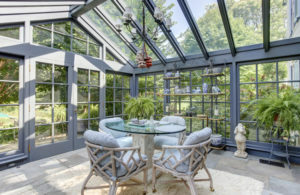 A spectacular solarium runs along the full length of the original structure, adding abundant sunlight to the 18th-century rooms and new space, warmed by radiant heat, from which to enjoy the views out to the heated pool surrounded by established gardens and a picturesque pond beyond. At the end of this glass-enclosed, plant-filled oasis is another surprise—a two-story great room with modern, open kitchen. 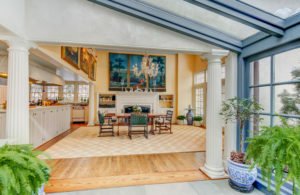 A space more likely seen in Architectural Digest than Colonial Homes magazine. This space, anchored by a large fireplace, is a natural magnet for groups of all sizes—from cozy fireside suppers to Christmas dinner for 30-some or a wedding for 200. And the Milner touches are seen in the quality of every detail—in custom period cabinetry, decorative columns, well-placed windows. Separated by a substantial island, the adjacent chef’s kitchen includes top-of-the-line appliances—six-burner Vulcan range, two Sub-Zero fridge/freezers and more. A walk-in pantry, the size of a small room, makes entertaining a pleasure. The charm of the original farmhouse has been carefully preserved yet thoughtfully modernized. 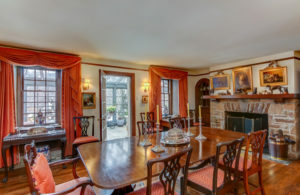 The formal living and dining rooms boast fireplaces along with custom woodwork and cabinetry, while the sunny home office has been equipped with hidden storage and updated for modern technology. Beyond the trophy room displaying both equestrian and auto racing awards, is the bar area with original kitchen cabinets, tiles and sink—a tangible link to the past. A powder room, convenient mudroom and back stairway complete this level. And below, there’s a farmhouse basement that could be finished for additional space. On the second level are three bedroom suites, with sitting rooms, dressing rooms and en suite bathrooms. One bedroom’s surprise is a large interior half-moon window looking into the great room below. The third floor includes two additional bedrooms, bath and laundry area. The most recent renovation encompassed upgrades to virtually all systems and installation of low-maintenance materials inside and out. The large 12+-stall barn, where champions have been stabled, includes a paneled tack and feed room, plus powder room and washer and dryer. The classic barn features an efficiency apartment, three-car garage plus an expansive loft, suitable for endless possibilities—equipment storage, displaying a car collection, entertainment space (aka party barn). Five pastures and paddocks with turnout sheds are nearby. Also on the property are a charming stone springhouse, and a nicely situated three-bedroom cottage with Quaker shed, accessed by a separate entrance. In short, Fairyhouse is a grand, historic horse farm to be treasured. For more information about this 58+acre property (2 tax parcels under Act 319), including the recently renovated country house, 12+-stall barn, 3-bedroom cottage, 3-car garage, located in award-winning Unionville-Chadds Ford School District, contact Amy McKenna at Country Properties, Berkshire Hathaway, Fox & Roach, 610-470-7138 (cell) or 610-347-2065 (office); TheCountryProperties.com.